We see it over and over: nothing makes a fundraiser sizzle like a live band, and no type of band is more appropriate than a rockin’ jazz band. It doesn’t have to be us, but we love to be part of a good cause, and offer a 501(c)(3) discount. 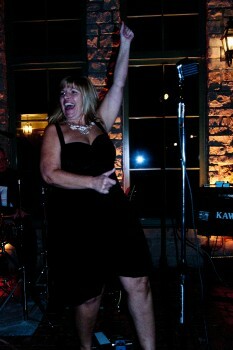 This is Barb at a Rainbow for Kids Fundraiser really spreading the fun. Just one example we’re proud of: We are honored to get to be part of the KEEN annual fundraisers. They are a class act with amazing people like Dave leading a group of talented folks for a good cause. (Kids Enjoy Exercise Now — gets less-abled kids up and moving.) This year they had their big to-do and raised a whopping $106,000 for their kids. No that is not a typo. A word about the many wonderful causes in St. Louis, and the many hard-working folks who put their do-or-die fundraisers together. We’ve gotten to play a lot of them, and we mean A LOT, so like weddings, we have opinions on how to make them better. Hire a band. Us? Sure we’d like that. Not us? Someone. There’s a lot of good ones. Don’t skimp. I’m sure like many we offer a discount for nonprofits, but it’s still “expensive.” We’re typically $550 for good causes. Can’t afford it? Let us tell you more about KEEN and their record-breaking number. They did it up right — everything. Our advice to you is go big or go home. Get them in the room with good live music, amazing catering, get a great, fun, pro photographer, and make sure everyone is having a good time. We’ve seen it — the difference between someone at the end of the night throwing in an extra $100 versus a $500 to your important cause. So to be clear we’re not claiming credit for KEEN’s great fundraiser’s success (though they did wonder aloud if we weren’t the best band in St. Louis). But we’re noting how when down well, it’s successful, and when it’s successful in this case, it benefits amazing kids who deserve a chance to excel in every way.